Gustav has said his goodbyes and left us with a few gifts - fallen trees, snapped electrical poles, power outages to over 90% of Cleco's more than 200,000 customers, including most of the Christian Challenge church family. I've attached a photo that is not an uncommon site around Cenla. There are literally hundreds of these fallen trees. Fortunately, *most* of them did not cause damage to structures. 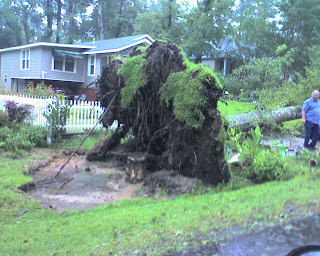 However, some homes and businesses have been severely damaged by falling trees, branches and/or hurricane force winds. In my role as City Councilman I've been involved in trying to restore the essential services of water and sewer service. We have 10 water wells and over 80 sewer lift stations. ALL of these infrastructure tools were taken offline when Cleco's primary transmission line that services our area failed. That's the bad news. We had to call for a emergency water conservation plan and a water boil advisory because our water pressure got precipitously low. The good news is that emergency power generators are being brought in and slowly our water wells are coming back online. As of this writing 3 of our 10 wells are online and are keeping our pressure up enough to provide minimal service throughout the city. Cleco is doing a heroic effort at restoring power. In driving around Pineville I'm surprised at how quickly certain areas are having their electrical service restored. It may be days or even weeks before everyone has their service restored. But hopefully Cleco will set a new record in power restoration. In my role as pastor I've contacted most of our church members and am pleased to report that there have been no structural damage reports. There are a LOT of trees down and a few leaky roofs, but thankfully no damaged structures. I'm also extremely proud of the way church members are reaching out to one another, checking on one another, providing basic needs, etc. you guys are an awesome bunch and I'm extremely proud to serve you as pastor. I *LOVE* serving Jesus with YOU!